Agents and brokerages can use a range of tactics to maximize the business rewards of giving back. They include involving clients in your good works, building a focus on giving back into your brand and effectively publicizing your contributions. Make sure you're doing everything you can to show off your good works to the world. Alex Abad says his mother has sold her shoes to put dinner on the table. That’s why the El Segundo, California-based real estate agent, who immigrated with his family to the United States when he was nine, makes a point of giving back. Abad has founded a charity that raises money for local schools, and he pays for the construction of homes for needy families in Nicaragua. He says he donates upwards of $30,000 a year. He makes these contributions because he wants to improve people’s lives, but he also hasn’t passed up the opportunity to leverage his charitable activities into more business. Abad donates about $5,000 a year to finance the construction of a home for a needy family in Nicaugaraga. He makes the gift through his membership with Giveback Homes. The company funnels donations from agents — who pay an annual membership fee of $50 — to homebuilding projects led by Habitat for Humanity in the U.S. and abroad. To engage clients and prospects around his contribution to this effort, Abad buys full-page ads in local newspapers announcing that he’s made a gift in partnership with a client that has changed a family’s life forever. 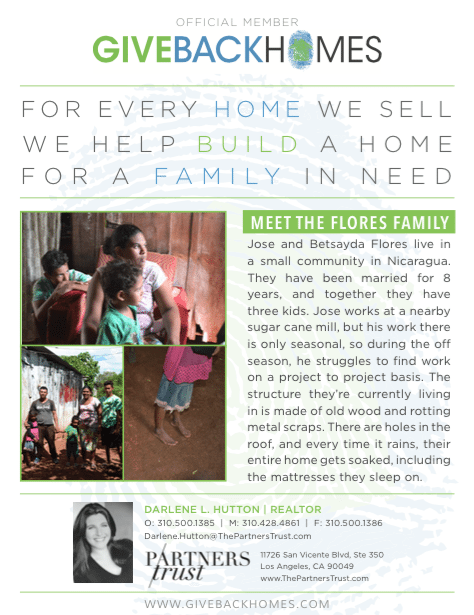 The ads (one of which is pictured below) feature photos of the families who’ve gotten homes thanks to his donations. Good Realty, a brokerage that donates 25 percent of every commission it earns to nonprofits, humanizes its charitable activities by posting photos of clients holding the checks that Good Realty cuts on their behalf to nonprofits. The Nashville, Tennessee-based Armstrong Real Estate Group is launching a nonprofit that will lend a helping hand to locals, such as by providing mortgage assistance and home improvement projects. The agent team will donate a portion of its profits to the charity and invite clients and other local businesses to chip in as well. Team leader Aaron Armstrong said this year that his team has already paid a woman’s overdue heating bills “to make sure she had heat during an ice storm” (see the video below), built a fence for a family and funded the installation of a playground at a local charter school. That’s one creative way for a brokerage to give back. Abad sees cooking up original projects — or, at least, unique ways to present good deeds — as the ticket to leveraging charitable contributions into more business. Some Giveback Homes members don’t fully invest themselves in the firm’s mission, according to Abad. “If you just use some of the tools and the logos, it’s great, but it’s not really drawing direct attention,” he said, referring to the marketing resources that Giveback Homes provides to members. Give Realty’s innovative take on social entrepreneurship has generated a steady stream of prospects and earned the affection and loyalty of clients — along with their referrals. 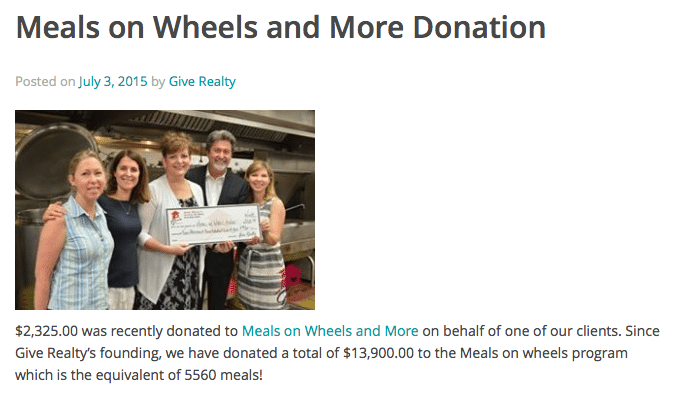 Give Realty doesn’t only funnel money to nonprofits. 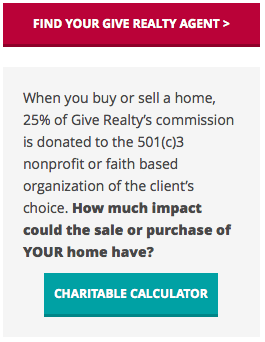 It actively cultivates generosity by asking clients to choose the recipient of the donation that comes out of Give Realty’s commission and making that donation in their client’s name. That creates a lasting memory for a client and increases the odds that the client may direct friends looking to buy or sell to Give Realty in the future. 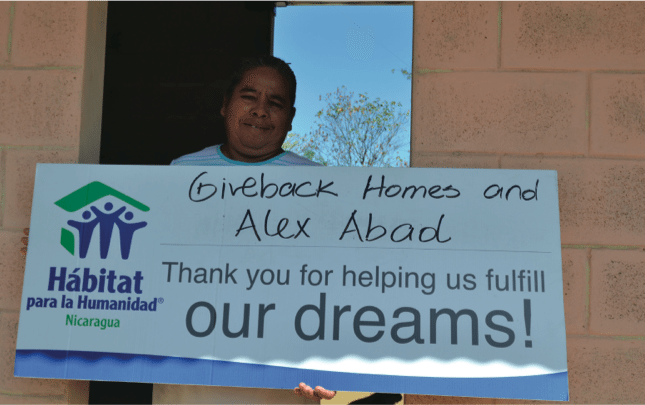 Abad invests clients in his work with Giveback Homes by asking them to choose the recipient of a home funded by his donation. He lets clients choose between three families, each of which he presents with biographies and photographs. “When you do it, the feelings are overwhelming because they see this family, they see this little girl, they see this little boy,” he said. Post, tweet, blog. Make sure you’re doing everything you can to show off your good works to the world. While not every agent or brokerage can trumpet a marketing message like Give Realty’s (“Change your address. Change your world.”), they can still benefit from using some of its other branding tactics to publicize their social contributions, such as prominently featuring descriptions, photos and videos of recent donations. Real estate agents can tap Giveback Homes’ digital toolkit for Giveback Homes logos to add to websites, email signatures and business cards, and to get Giveback Homes-themed tweets, Facebook posts and listing presentation handouts. 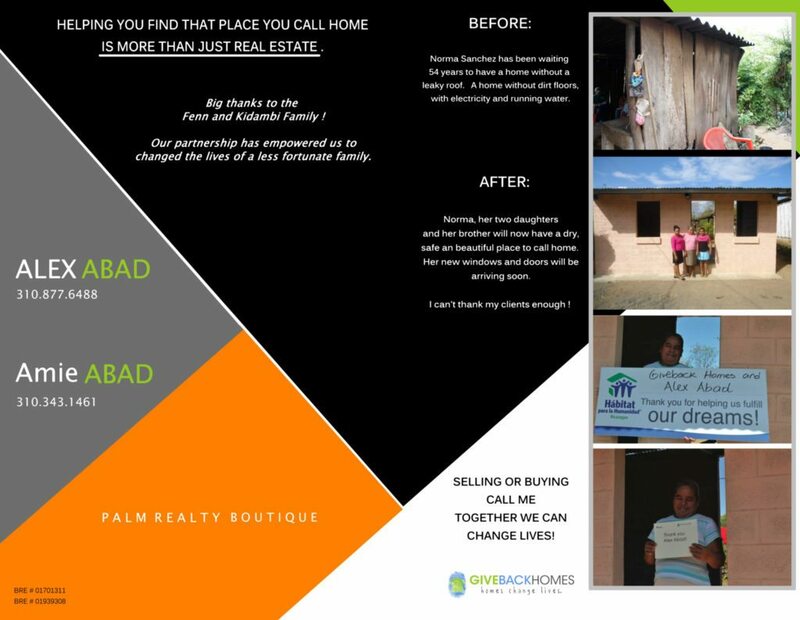 They can also call on the support of Giveback Homes’ marketing team to generate Giveback Homes-themed marketing materials, including custom ads, thank-you letters, postcards and door hangers. Giveback Homes even offers rider signs. Besides publicizing his contributions in advertisements, Abad also presents a “Giving Back” tab on his website that features descriptions and photos of nonprofits he works with, including Commissions for Education, which Abad created to raise money from real estate professionals for local schools, and Giveback Homes. Screenshot showing the “Giving Back” section of Alex Abad’s website. Agents and brokerages can send updates on charitable activities to engage prospects or past clients. Abad sends updates to contacts on the progress of home construction projects he’s funding. This “generates a tremendous experience of what it means to give,” while keeping Abad top of mind, he said. Abad provides updates to contacts on the construction of the homes he funds. They can include photos of beneficiaries, like the one above. Everyone likes a feel-good story. That’s why brokerages or agents should pitch stories on their charitable efforts to local media. San Francisco-based Zephyr Real Estate recently took a crack at this, firing out a press release announcing that the brokerage had partnered with a local title company to donate 175 filled school backpacks to the San Francisco Child Abuse Prevention Center. Members of Giveback Homes can get help crafting press releases and story pitches highlighting the contributions they’ve made. “Anytime there’s an opportunity to incorporate them into a story, we do,” said Caroline Pinal, vice president of brand and marketing at Giveback Homes.